On April 24, back in 1185, two powerful Samurai clans fought to the death on the Dan no Ura bay of Japan’s Inland Sea. The ruling clan, the Heike (house of Taira), was led by their child-Emperor, Antoku, and his grandmother. The Heike had ruled for many decades, but now, massively outnumbered, they faced defeat at the hands of the Genji clan (house of Miyamoto). This crucial battle was a turning point for Japanese history: the Genji clan’s victory at Dan no Ura marked the beginning of seven centuries in which Japan was ruled by warriors and Shoguns instead of Emperors and aristocrats. For the Heike, surrender wasn’t an option. But when 3000 enemy ships attacked under cover of a storm, they were vastly outnumbered and underprepared. Knowing a bad deal when she saw one, the Emperor’s guardian and gran took the child’s hand and together they jumped into the ocean, opting for death on their own terms rather whatever gruesome end would be on offer from the enemy. The remaining Heike warriors, about 1000 ships-worth in all, followed their leader into the ocean or were thrown there by the enemy and left to drown. Now, every April, there is a festival to remember the Heike. Legend has it that the warriors still walk the ocean floor, albeit sideways. 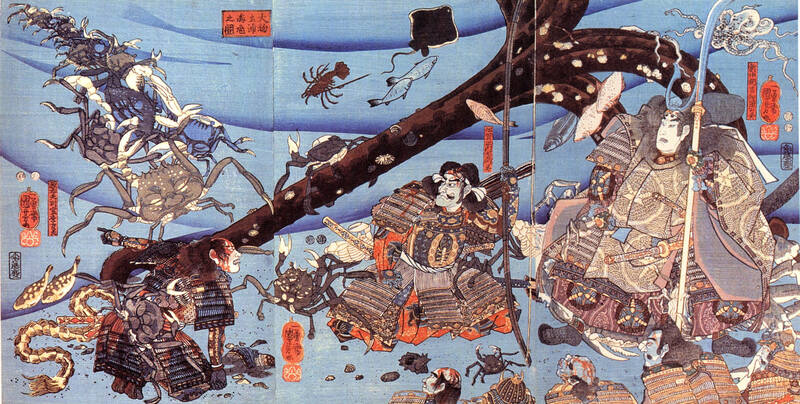 The story is that when the Emperor jumped, he and his warriors were transformed into crabs, called heikegani, or Heike crabs (Heikea japonica in Latin; 平家蟹 in Kanji). But the transformation was not complete: the shells of these crabs are still marked with grooves and ridges that form the faces of the Samurai warriors. Theory 1 has it that local fishermen weren’t keen on eating the spirit of a brave samurai, so any crab with a shell that looked even vaguely like a samurai’s face was thrown back. The result? Ordinary crabs were removed from the sea in favour of samurai crabs, and these samurai crabs went on to breed and produce more samurai crabs. 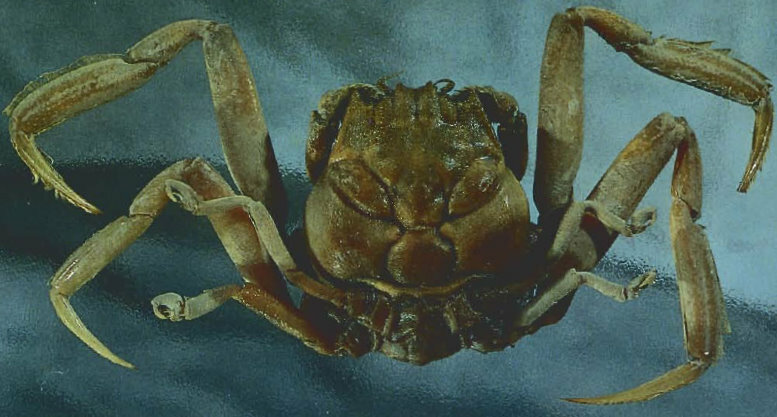 Crabs that most resembled a samurai were most likely to live. Check out this explanation by popular scientist Carl Sagan. This is the most boring of the arguments. Apparently there are at least a dozen other species of crab around the world that also have human faces on their shells. The theory here is that although the ridges and lines on the crab’s shell might seem to form faces, they are actually positioned to protect muscles and organs underneath the shell, and have nothing to do with samurai warriors. 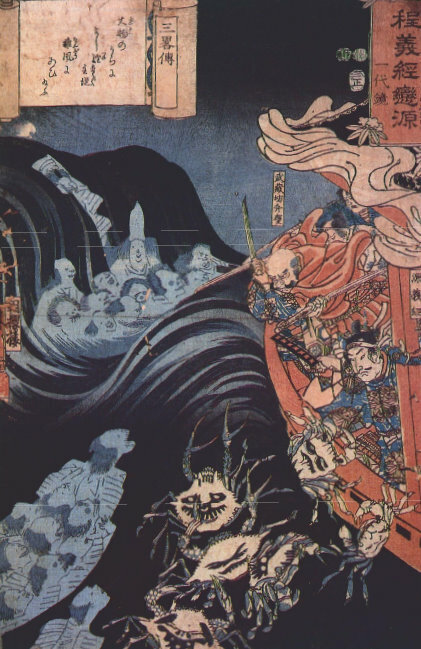 Tags: contestability in history, Heike crabs, heikegami, history, history cause and effect, Japanese demons, Japanese legends, Japanese mythology, Japanese yokai, samurai, selective genetics and culture | Permalink.